A Black and white image of the Comenius Club Officers and Committeemen from the 1907 Cornhusker. At this time the Komensky club went by Comenius which is another version of Jan Amos Komensky's (1592-1670) name. The club is named in honor of this seventeenth century Czech educator and philosopher. 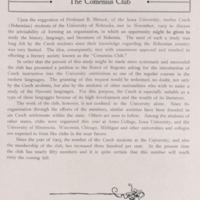 This is the only yearbook from 1907-1920 where the club is represented at the University with the title of The Comenius Club. 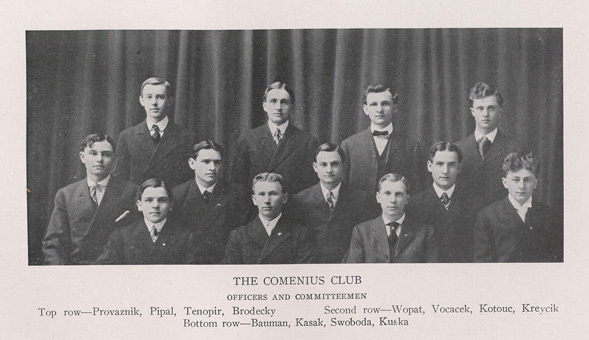 A Black and white image of the Comenius Club Officers and Committeemen from the 1907 Cornhusker. The second page outlines the new club's origin and purpose. In order that the pursuit of this study might be made more systematic and successful the club has presented a petition to the Board of Regents asking for the introduction of Czech instruction into the University curriculum as one of the regular courses in the modern languages. The granting of this request would be welcomed, no doubt, not only by the Czech students, but also by the students of other nationalities who wish to make a study of the Slavonic languages. For this purpose, the Czech is especially suitable as a type of these languages because of its high development and the wealth of its literature. The work of the club, however, is not confined to the University alone. Since its organization through the efforts of the members, similar societies have been founded in six Czech settlements within the state. Others are soon to follow. Among the students of other states, clubs were organized this year at Ames College, Iowa University, and the University of Minnesota, Wisconsin, Chicago, Michigan and other universities and colleges are expected to form like clubs in the near future. 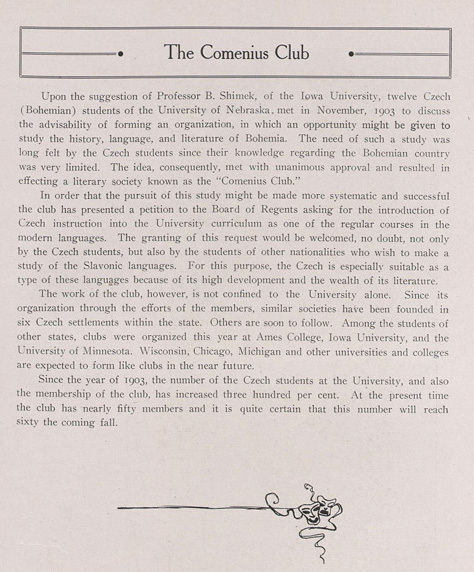 Since the year of 1903, the number of the Czech students at the University, and also the membership of the club, has increased three hundred per cent. At the present time the club has nearly fifty members and it is quite certain that this number will reach sixty the coming fall. 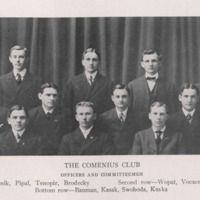 “ The Comenius Club 1907,” Nebraska U, accessed April 25, 2019, http://unlhistory.unl.edu/items/show/315.